A forensic officer at the scene of the murder in Twinbrook. Three teenagers were still believed to be in custody as of Sunday night as police conducted a murder probe following the discovery of a young man’s body. The Ambulance Service said the man – Christopher Meli, aged 20 – was found by a passer-by on some grass next to a pathway in the Twinbrook area of south-west Belfast. The passer-by reported seeing blood coming from his mouth and his head, and believed him to be dead. Paramedics confirmed this when they arrived at the scene. The death was announced by police at around 12.05am on Saturday, and they said it was being treated as murder. Mr Meli was understood to have been a former pupil of De La Salle school, and to have lived in the Ballymurphy area – both in the west of the city. His body was found near the Stewartstown Road and the Glasvey neighbourhood. A spokesman for the Catholic parish of Corpus Christi said on Sunday night that there were no funeral details as of yet. A post-mortem is to be conducted to help establish the cause of death. Three teenage males, two aged 18 and one aged 16, were arrested on Saturday following the killing. Another young man – whose age could not be confirmed by the Belfast Health Trust – was also hurt in relation to the incident. He had been taken to the Royal Victoria Hospital, but was later released. 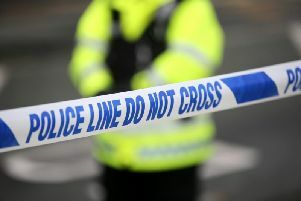 In addition to being arrested on suspicion of murder, the three teenagers were also being questioned on suspicion of attempted murder in relation to the young man who was taken to hospital. At time of writing at 11pm last night, police had given no indication of their release. Police forensic teams spent most of Saturday searching the area for evidence. Meanwhile, floral tributes were attached to a tree in the area, including one from his aunt Eileen. One member of Mr Meli’s family on Sunday night told the BBC that the man who was hospitalised but later released had been knocked out during the attack, and that “the last thing he remembered before he got up to run away was Christopher was on the ground, and they were kicking him”. Sinn Fein councillor Steven Corr said on Twitter that, after calling with Mr Meli’s family, “we are going to hold a candlelit vigil in Slaibh Dubh estate”. This is to take place at 7pm today. The PSNI has asked anyone with information to contact detectives on the non-emergency number 101, or if someone prefers to provide information without giving their details they can telephone the independent charity Crimestoppers on 0800 555 111.